US President Donald Trump made a surprise visit Wednesday to American troops in Iraq, the first ever by the US leader to US overseas military base since assuming office in 2016. The supreme US armed forces commander visited Al-Asad Air Base in western Iraq. He was accompanied by his wife Melania Trump. 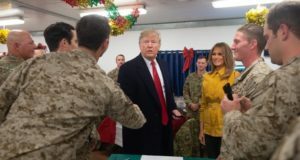 “President Trump and the First Lady travelled to Iraq late on Christmas night to visit with our troops and Senior Military leadership to thank them for their service, their success, and their sacrifice and to wish them a Merry Christmas,” White House spokeswoman Sarah Sanders Twitted. The visit came as Trump seeks to reduce US troops’ presence in the region, where, he said, America no longer has a major role to play. Last week, President Trump ordered the withdrawal of American forces in Syria where they have been since 2014 fighting the Islamic State group (ISIS). Trump is also mulling plans to cut down US troops in Afghanistan. As Trump orders troops thorough pullout from Syria and a slash in soldiers levels in Afghanistan, an Iraqi official has revealed that the Pentagon has established two new military bases in Iraq. Farhan al-Duleimi, a member of Anbar’s provisional council, told Turkish Anadolu Agency that the US has established a military base in the northern Rumana subdistrict (in Anbar’s Al-Qaim district) near the Syrian border. A second base, he said, has been set up in the east of the city of Al-Rutbah, about 310 kilometers west of Ramadi and less than 100 kilometers from the Syrian border. The facilities will host scores of US troops including drones and other equipment that will be used to thwart the infiltration into Iraq of ISIS fighters. There are currently around 5,000 American boots in Iraq. Posted by KanelkaTagba on Dec 27 2018. Filed under Headlines, World News. You can follow any responses to this entry through the RSS 2.0. Both comments and pings are currently closed.